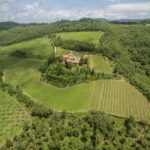 Excellent property to provide both home and income, Chianti Classico vineyard and Agriturismo with winery, olive grove and land. 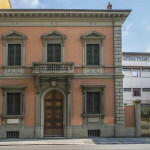 The property is composed of two main buildings, described as follows. It has a total surface of 1500 square metres and is disposed on two floors, boasting typical features of the Chianti farmhouses, with a typical Tuscan stone construction and internal layout. The first floor includes some boardrooms, show room and an apartment of 90 square metres, including a mezzanine. The 150 square-metre hall, placed next to the apartment, is equipped with electrical system, heating system and air conditioning system and is perfectly furnished to be used as a restaurant. There are bathrooms and vestibules next to it, as well as a professional kitchen. The house has been recently carefully restored by using top quality materials. The floors are in old hand-made terracotta tiles, while the ceilings are with wooden beams and terracotta tiles. The external area is provided with three automatic gates. All the external patios, delimited with stone boundary walls overcome by iron balustrades are paved with stone and have a total surface of 598 square metres. The ground floor has a total surface of 850 square metres and includes a room used for wine-making, completely geared with barrels for wine ageing, concrete tins and any additional necessary equipment. This is also the room where the conservation, storage, bottling and packing happen. 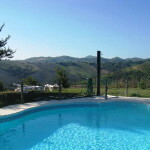 With a surface of 200 square metres, it is currently working as an Agriturismo and set on two floors plus a basement working as a warehouse and surrounded by a garden. This building, which has recently undertook a restoration and is, therefore, in perfect condition, is very bright and airy, set on two floors connected by external staircase with old stone steps. The internal layout of the building is composed of seven rooms, plus some vestibules and bathrooms on the ground floor and additional rooms, entrance hall and bathroom on the first floor. On the lower ground floor are located the technical room and two additional deposit rooms. 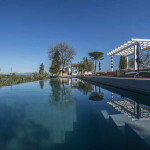 The property is completed by 31.64 hectares with 26 hectares of Chianti Classico D.O.C.G. and 2 hectares of olive grove, 3 hectares of woodland and 0,64 hectares of agricultural land, plus 1000 square metres of garden, provided with irrigation system and lighting system. The vineyards, recently planted, are well cultivated and in good conditions. 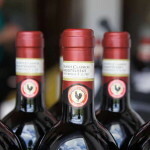 The estate has a total yearly production of approximately 1500 quintals of Chianti Classico D.O.C.G. wine. TYPE Chianti Classico vineyard and Agriturismo with winery, olive grove and land.